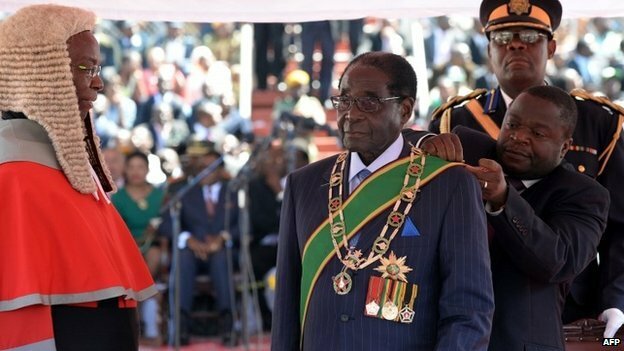 Zimbabwe’s Robert Mugabe has been sworn in for a seventh term in office as the country’s president. Thursday has been declared a public holiday to allow supporters of Robert Mugabe, 89, to attend the inauguration. The ceremony had been delayed by a court petition filed by his main rival, Morgan Tsvangirai, over allegations of widespread electoral fraud. But the Constitutional Court dismissed the case, declaring Robert Mugabe’s re-election “free, fair and credible”. Robert Mugabe won with 61% of the presidential vote against 34% for Morgan Tsvangirai on July 31. The elections ended a fragile power-sharing government formed by the two men in 2009 under pressure from regional leaders following elections the year before marred by violence and allegations of electoral fraud. Outgoing Prime Minister and opposition leader Morgan Tsvangirai said he would not be attending the inauguration ceremony. “Expecting Tsvangirai to attend the inauguration is like expecting a victim of robbery to attend a party hosted by the robber,” his spokesman, Luke Tamborinyoka, told AFP. Free fizzy drinks and T-shirts reading “Mugabe fearless revolutionary” were being given to the arriving crowds. The US and UK have expressed concern over the official results granting victory to Robert Mugabe and his Zanu-PF party. Morgan Tsvangirai’s Movement for Democratic Change (MDC) lost two court cases related to fraud claims in last month’s disputed elections. Rulings were issued despite the MDC withdrawing its case saying it would not get a fair hearing. The party alleged that more than a million voters were prevented from casting their ballots in polling stations, mostly in the capital and urban areas considered to be MDC strongholds. The Zimbabwe Election Support Network, which placed 7,000 observers around the country, has also judged the election flawed. MDC officials have indicated they are unwilling to continue their partnership government with Zanu-PF. Meanwhile, the US said recently that sanctions imposed on Robert Mugabe and some 119 other Zimbabwean individuals would remain in place until there were further political reforms. Some 40 heads of state and government have been invited to attend the high-profile inauguration ceremony. Once inaugurated, Robert Mugabe will serve another five-year term. Under the new constitution approved in a referendum earlier this year he will be able to serve another term after this. Robert Mugabe served as Zimbabwe’s first post-independence prime minister between 1980 and 1987, and has held office as president ever since.